Let your dog and Harvard Medical School help you exercise more, manage your weight, and improve your health! Ongoing research is showing that the health benefits of owning a dog are undeniable. Dog owners have lower blood pressure and healthier cholesterol levels, and a lower risk of heart disease, than non-owners. There are also many psychological benefits to having a pooch around. Dog owners are less prone to bouts of loneliness, anxiety, and depression. Simply petting your dog can make you feel less stressed. One of the greatest benefits of owning a dog is that it encourages you to practice mindfulness — being in the present moment and fully appreciating life. Mindfulness can help you relieve stress and also improves your overall health. 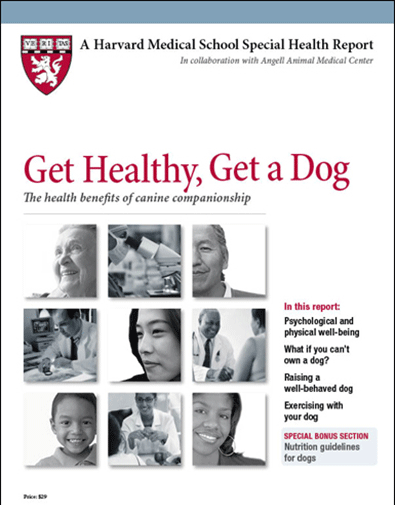 Get Healthy, Get a Dog, a brand-new Special Health Report from Harvard Medical School and the Angell Animal Medical Center, delves into the many ways that dogs can improve the lives of humans. It also offers simple ways to keep your dog fit and healthy. You'll discover exercises to share with your pooch and simple ways to train him or her to be the perfect workout partner. This report also covers the pet adoption process, canine nutrition, and ways to benefit from canine contact even if you're not a pet owner. With the guidance offered in this Special Health Report, owning a dog can be one of the most physically and emotionally rewarding relationships you’ll ever experience.